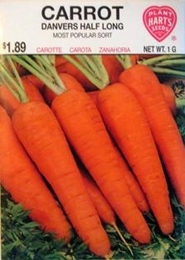 A favorite main crop carrot with root 6-7 inches long and 1 3/4 inches thick. Fine textured, tender bright orange flesh is rich in flavor and very sweet either cooked, raw or frozen. A heavy yielder and good keeper.